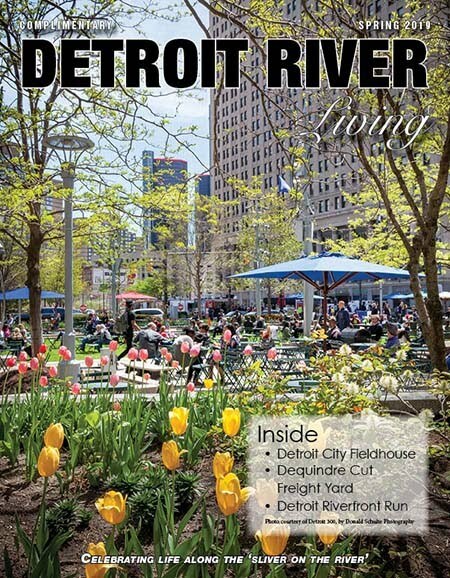 Welcome to the spring issue of Detroit River Living! Finally, the days will warm enough to enjoy leisurely walks on the riverfront. That’s something I’m most looking forward to with my husband and our two-year-old. Graham has finally reached the age at which “stop,” “no,” and “stay here” work. He was not happy on similar walks last year, confined to his stroller. The boy’s independence is obvious and we have finally begun letting him explore more freely. Last month we did so at DNR’s Outdoor Adventure Center. What a blast for a toddler! While Grandma, Mom and Dad could appreciate the educational aspects of the center, Graham’s favorite features were undoubtedly the slide and waterfall. Have you been? It was a worthwhile substitute for warmer days on Belle Isle. For such a large city, the number of children’s activities on the river alone is astounding! Along with the RiverWalk, Belle Isle and Outdoor Adventure Center, there is now Detroit City Fieldhouse, which we feature on page 18. It includes leagues for all ages at prices well below average. And though I’m not athletic, I love a friendly sports bar. That’s what the Fieldhouse also has to offer – a bar and restaurant, called The Clubhouse, overlooking two indoor soccer fields and airing soccer games from around the world on several screens. It’s even kid-friendly, and boasts a European-inspired menu, with kielbasa, meat and vegetarian pies, a ploughman’s board, as well as the usual suspects, like wings and nachos. An impressive addition to the sliver on the river! Finally, I look forward to making a family affair of the Detroit Riverfront Run. I’ve never participated (not athletic, remember). But plenty of strollers were spotted at last year’s race. As long as I keep my speed up, Graham shouldn’t get too bored. Wish us luck! Further, the kind words and compliments we have received have helped spur us on to make every issue of Detroit River Living even better than the last — a stand-alone work of art. Publishers John and Terry Minnis look forward to discussing our exciting new magazine and business venture with you! Call us at (313) 640-8955 or send email to publisher@detroitriverliving.com!